Performance and biocontainment capabilities unattainable with high-speed or super-speed centrifuges. 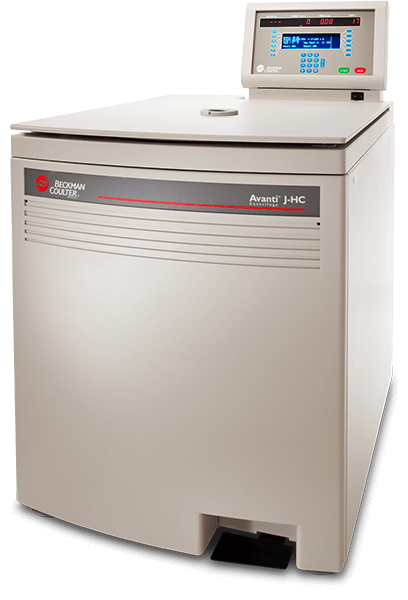 The J-HC three-phase high capacity centrifuge provides you with a complete solution for batch bioprocessing. Three-phase separation filters the materials into liquids, gasses, and solids. A maximum of nine liters can be spun at speeds of 5,000 RPM and 7,480 x g for greater sample throughput. This allows processing of up to 36 liters per hour when harvesting bacteria. Enhanced operator safety is provided with disposable HarvestLine System Liners. Features include a high-torque, energy efficient drive for the fastest acceleration and deceleration possible with gentle precision. Also, advanced programmability, automatic rotor identification and imbalance safety check, CFC-free refrigerants, Friction Reduction System (FRS) for optimum temperature control, low energy consumption and low heat output. Includes Paperless documentation, data management, and current good manufacturing practice (CGMP) compliance with the Spintrace II network software. The J-HC is the highest capacity centrifuge in its class and provides the fastest accel and decel times with exclusive SR (Switched Reluctance) Drive technology.